The town of Kildysart lies a few miles north of Limerick on the west coast of Ireland, deep in County Clare. It contains one church, one grocery store, two main roads and seven pubs. It is also the birthplace of my great-great paternal grandfather and the last point of record of our family in Ireland. 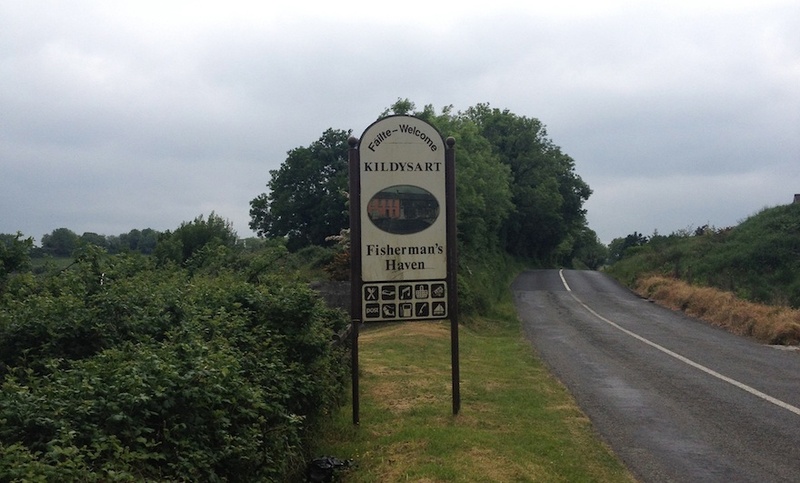 I arrived in Kildysart with my father on a morning in early June. We looked in on the church, strolled the length of the high street and peered in a few shop windows. It took about 15 minutes in total. We knew what to expect from Kildysart. An aunt had traveled through a few years prior and had described the town as “sleepy.” She is a polite woman. “Comatose” might be a more appropriate characterization. There are roughly two-dozen storefronts along Route 473, which runs through the center of Kildysart. Of those two-dozen, maybe two were open. At four in the afternoon. On a Tuesday. “Well, we went to Kildysart,” my dad declared, “And it was closed.” We then got back in our rental car and set off for nearby Ennis. “And the Ennis tourism board knows that,” he replied. He was right. Ennis has been coiffed and sculpted into the perfect picture of Irish pastorality. The stone houses lean in close over the winding streets. Around every corner, a quaintly named teashop. Gentlemen farmers in mud-spattered wellies abound, and even a few Irish setters can be spotted panting at the heels of their tweed-clad masters. The Ennis Friary, a ruined monastery from the 13th century, is the town’s crown jewel. I was unable to see it up close as it’s currently being renovated. That’s right: A 730-year-old ruin is being renovated to update the informational signage, walkways and other tourist amenities. The Washington Post reports that of the 34.5 million Americans who consider themselves as primarily or partially Irish (more than seven times the population of the entire Republic), the overwhelming majority are concentrated in New England, New York, New Jersey and eastern Pennsylvania; Boston, New York, Philadelphia, Chicago and D.C. are also the most frequent points of origin for direct flights to Shannon or Dublin airports. These are what Tourism Ireland calls “gateway cities,” home to 6 million economically viable Irish-Americans who are targeted with special, heritage-focused promotions. So lucrative is this demographic that in 2010, at the lowest dip of the Irish recession, the Irish Department of Foreign Affairs considered giving American tourists of proven Irish ancestry special “Certificates of Irish Heritage” that would qualify them not for freer and easier travel to and from the Republic and E.U., but discounts at some of the country’s top tourist attractions. The marketing ploy is working. Lonely Planet found that Americans find Galway to be “the most Irish” of all Irish cities. The Galway tourism board has wasted no time in capitalizing on this reputation. The picturesque row houses of the Latin Quarter — easily the most heavily trafficked neighborhood in Galway — are stuffed to bursting with T-shirt shops, five-year-old pubs masquerading as age-old establishments and Italian restaurants for travelers weary of Irish stew. Sure, it may be one of the few cities where you can still hear Irish Gaelic spoken in the streets, but in terms of Irish-ness, Galway is small step up from Epcot. Ideas of authenticity and patrimony, with the all the amenities of home — these are the products that Ennis, Galway and towns like it are marketing. Irish-Americans are a consumer base with expectations and demands. Ireland is not Zion, an unchanging memorial to a far-flung diaspora. Ireland is Disney World, molded and manipulated to accommodate the deep-pocketed prodigal sons and daughters. A simple passing interest in our return, a token of recognition would have been welcome. But when I came to the place where the concepts of authenticity and heritage intersect, in Kildysart, the authentic was mundane, and the heritage not as romantic as I had hoped. I wanted an authentic Irish experience, I wanted a patrimonial one. Tourism Ireland peeked into my soul and wrote a marketing report about it. But Kildysart is not a resort town, nor does it pretend to be. The storefronts on Route 473 are utilitarian, meant to meet the needs of the local populace and no one else. In a town of less than 1,000 working-class Irish, who goes out to lunch on a weekday? Two American tourists wearing L.L. Bean rain slickers and snapping photos with their iPhones. Practically speaking, there is no context to suggest that Kildysart was ever an attractive place to visit. The American dream of a historic Emerald Isle is a fantasy. There’s a reason there are seven times more Irish in America than in Ireland: Their ancestors left, came to America and, after a generation or two of hard adjustment, generally prospered. The island they escaped — and yes, I do mean escaped — was a land of political oppression, sectarian violence, poverty and, most infamously, famine. By 1860, nearly 2 million Irish had already arrived in America, with an explicit majority fleeing the Great Irish Famine. The famine death toll in combination with mass emigration nearly emptied Ireland, perpetuating a steady decline in population that lasted until the end of World War II. Even as population picked up again in the 1950s, the new generation of native-born Irish had to deal with the violence and political instability brought by the Troubles, ending only with 1998’s Good Friday Agreement. Yet, the houses that sprung up on the outskirts of Dublin and in towns like Kildysart during the years of growth and peace that followed the Good Friday Agreement are not replicas of the handsome stone row houses of Ennis; they are pink stucco and cinder block. The style indicates a desire among native Irish not to look back, but to look forward. Thus, to feel entitled to a bucolic ideal in modern Ireland is no different than demanding geisha and pagodas in modern Japan. The only difference is, in Japan’s case, that bucolic ideal may have once existed. Irish-Americans seem to have forgotten the reasons that brought their ancestors across the Atlantic. They want what the Greek-Americans have in Greece, the Italian-Americans in Italy: a halcyon old country. But the collective Irish history has no definitive golden age. Unlike the Greeks, we don’t share a history of storied prosperity or political dominance. What connects us, what brought us to America is, for the most part, tragedy. I am what Fáilte calls an ABC1, or “college-educated American.” I spent my undergraduate years studying European history and literature, and consequently, I have a realistic idea of 19th-century life in Ireland. But even with this knowledge at hand, I still took my business to Ennis in search of romance. And she embraced me. I lunched on a gourmet sandwich at Town Hall, the original meeting place of the Ennis Town Council, now a converted bistro. I browsed rows of Hunter boots and Barbour jackets at a high-end hunting and fishing outfitter’s. I paged through a book of Celtic myths published in Oxford and sold by a bookshop headquartered in Limerick. I bought my mother a Christmas ornament, a Celtic cross carved from Connemara green marble quarried over 50 miles to the northwest of Ennis. I discarded authenticity, I discarded patrimony. And for what? East Hampton with a Celtic twist. I am no better than the unapologetic tourist: the Boston man who loudly and repeatedly reminded the Town Hall waitstaff that his great-grandfather was born nearby, the middle-aged women squabbling over shamrock T-shirt sizes in thick Minnesota accents, the pimply teen thoroughly taking advantage of the country’s drinking age. I may have rolled my eyes and shook my head upon encountering them, but we all bought different models of the same product. Mine was Ennis, theirs was the Guinness Storehouse — outwardly different, but the same in essence, both marketed to the same customer. I was dissatisfied by my experience in Ireland. That romantic moment of ancestral connection never happened, and the idea that it would was atavism at best — a trap my father did not fall into. Like me, he had realistic expectations of what Ireland would be like; unlike me, he maintained those expectations. After our week of navigating roundabouts and narrow country roads, we crossed the Irish Sea to spend a few days in Edinburgh, a city dad openly and frequently proclaimed he had “fallen in love with.” It’s easy enough to do: Edinburgh boasts a genuine architectural continuity, tastefully run tourist attractions and a congenial population unconcerned with the lucrative return of once-native sons. Dad has a knack for finding homes away from home. Paris’ Latin Quarter, Lake Como, Mount Desert Island, Santa Barbara, Andalusia and now Edinburgh — all places to which he has no personal or ancestral connection, but an attraction that is nevertheless pure. Therein lies the difference between the various planners and committees that preside over Ennis and Edinburgh: Ennis has been transformed into a town for tourists – saccharine, highly processed and disingenuous; Edinburgh, however, is honest. There’s an understanding there that good restaurants, walkable streets and a friendly populace are enough. It trusts that tourists, if left to their own devices, will find reasons to spend money. And maybe, some day, return. "Lit Nerd Abroad: Ireland & Scotland"
"The 10 Coolest Eastern-European Books You've Never Heard of"
"Chechnya, Then & Now: A Reader’s Guide"